Boulder, Colorado. 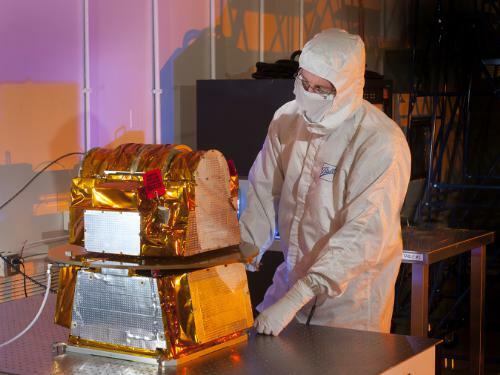 July 11, 2014 – An instrument for the nation’s next generation polar-orbiting satellite arrived at Ball Aerospace on Tuesday, June 17. The Clouds and Earth’s Radiant Energy Systems (CERES) instrument measures the reflected sunlight and thermal radiation emitted from the Earth. The observations from CERES are essential to understanding the effect of clouds on the amount of energy coming in from the sun and radiating out from the earth. This measurement, called the energy balance, is one of the largest sources of uncertainty in the climate. Long-term satellite data from CERES will help scientists and researchers understand incoming and outgoing links between the Earth’s energy balance and the role played by the atmosphere. Data from CERES will also improve observations of seasonal climate forecasts, including large-scale events like El Nino and La Nina. CERES was built by Northrop Grumman’s Aerospace Systems division and is part of the Joint Polar Satellite System (JPSS), the nation’s next generation polar-orbiting satellite. Three additional JPSS-1 instruments are expected to arrive over the next 10 months. Ball Aerospace is responsible for designing and building the JPSS-1 satellite bus, integrating all instruments, and performing satellite-level testing and launch support. The JPSS-1 satellite bus is on track for completion this fall, with instrument integration set to begin later this year. An additional instrument, the Ozone Mapping and Profiler Suite-Nadir (OMPS-N), was built by Ball. The OMPS-N has passed its pre-ship review and will be “shipped in place” to the JPSS program. OMPS data is used at NOAA for numerical weather prediction modeling and a variety of environmental observations, like volcanic ash monitoring to aid in aircraft safety warnings. Data from OMPS continues three decades of total ozone measurements. NOAA is responsible for the funding and requirements for JPSS and teams with NASA which procures the flight and portions of the ground segment. NOAA is also responsible for operations of the satellites and instruments after launch.